November is National Adoption Awareness Month, with programs promoting adoption across the United States. The statistics are staggering: UNICEF estimates that there are more than 143 Million orphans worldwide. Every day more than 5,760 children become orphans. More than 500,000 children live in foster care in the U.S. Studies have shown that 10-15 percent of orphans commit suicide before the age of 18, and more than 60% of orphaned girls will become prostitutes while 70% of the boys will become hardened criminals. Each year over 14 million children grow up and “age out” of the system without ever being adopted into a loving home. The Adoption Practice Group of Jocham Harden Dimick Jackson, PC (JHDJ Law), is committed to promoting adoption education and dedicated to helping clients who want to grow their families through adoption or reproduction alternatives such as surrogacy. In a recent trip to the Democratic Republic of Congo (DRC), JHDJ Law attorney Michele Jackson visited 5 orphanages and more than 200 orphans while distributing 6 boxes of donated clothing and school supplies. 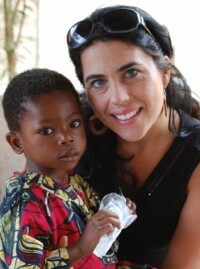 She saw firsthand the poverty and desperate living conditions of the children. One of the orphanages did not have electricity, blankets or running water, yet it houses 48 children ages 4 months to 14 years. In the DRC alone, it is estimated that as many as 400,000 children are available for adoption. The time for completion of an adoption is typically 4-12 months, which is much shorter than many other nations currently offering inter-country adoption. Since travel is not required and the completion time is shorter, the overall costs will typically also be less than other international adoptions. Families interested in adopting from the DRC may inquire about the process to immediately submit applications. Domestically, private and agency adoptions offer prospective parents an option to grow their families. Families pursue adoption for many reasons, but it is important to talk with an attorney about the financial and emotional risks of adoption before selecting a program or committing to a private match with a birth mother. Adoption is a legal process and laws vary by state. It is important that all parties to an adoption seek advice from an attorney to understand their rights and help stabilize the process. Prospective adoptive parents should discuss and understand the costs involved at the various stages of match and placement, while birth parents should be informed of the resources available to support them through the process.